Eric Asimov, New York Times's wine critic, visited Fishkill Farms among other fellow cider makers to explore the cider making in the Hudson Valley including, the terroir that contributes to rich and eclectic ciders across the region, brief histories of the farms/cider makers and their triumphs and challenges in growing/foraging cider apples. So what’s this grafting business we’ve been talking about? 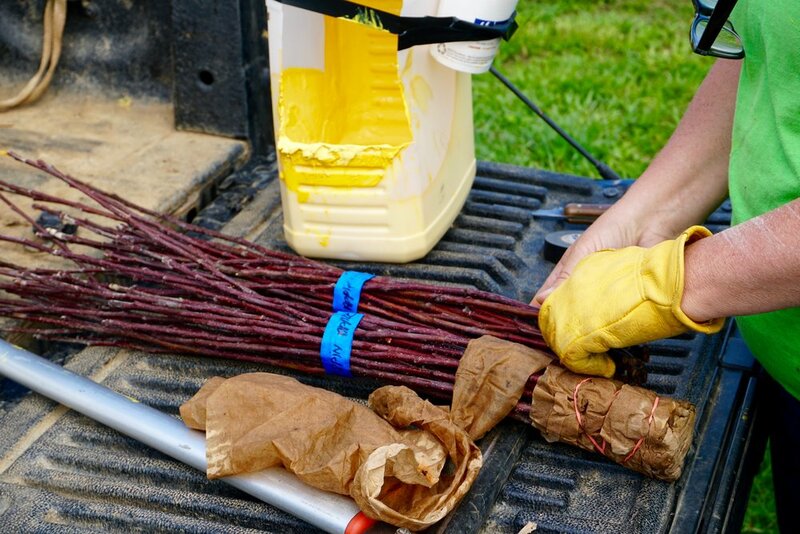 Grafting is the technique of joining the tissue of the budwood of one variety of fruit with the tissue of compatible rootstock. 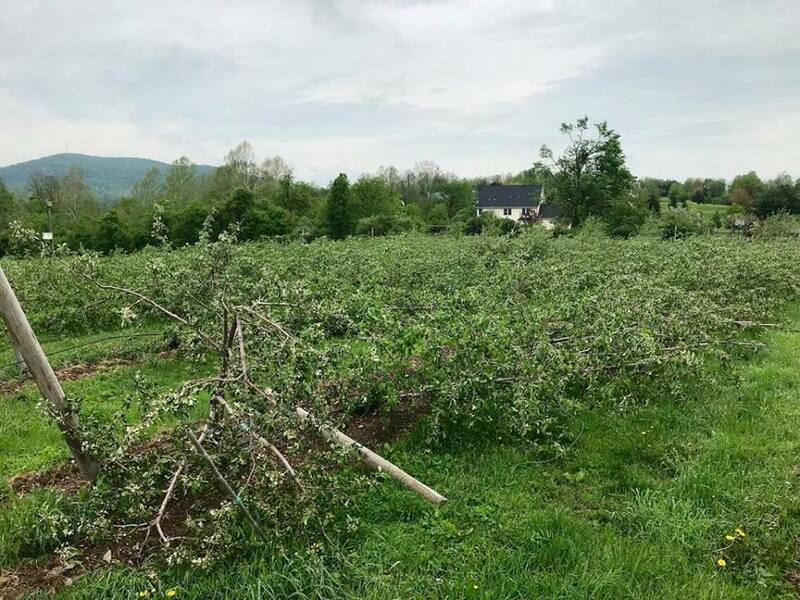 Essentially, we are taking the base of an existing apple tree of a certain variety and turning it into a different variety. 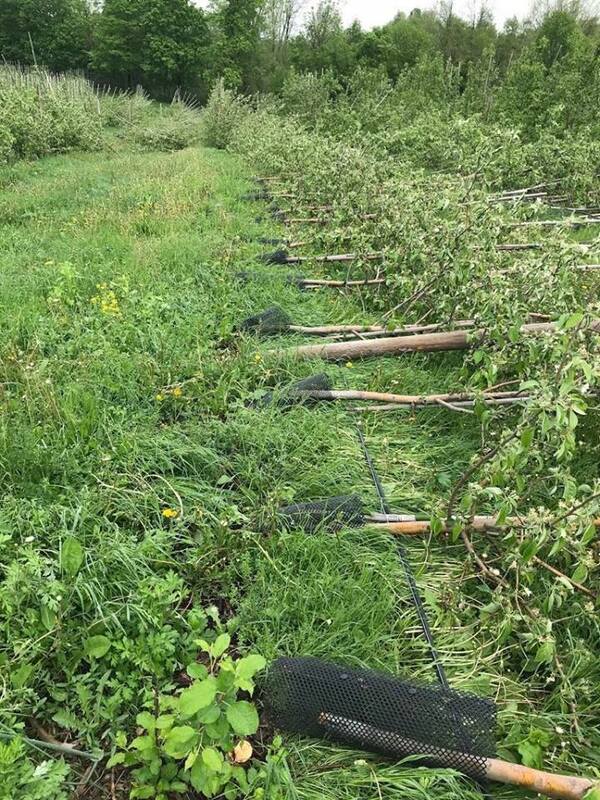 This is a much faster way to change over varieties in the orchard than planting whole new trees. 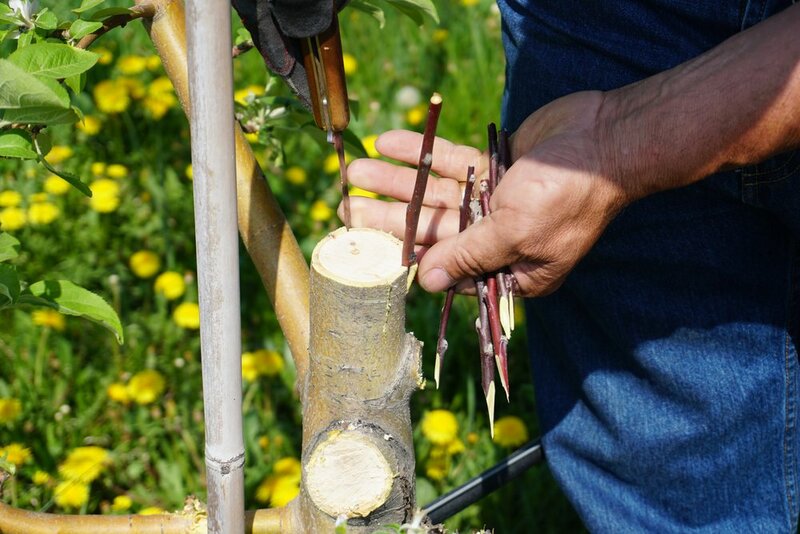 Grafting must be done just before buds are formed and while the sap in the tree is rising. This is when the tree is still in a rapid growth stage and sending its energy upwards. 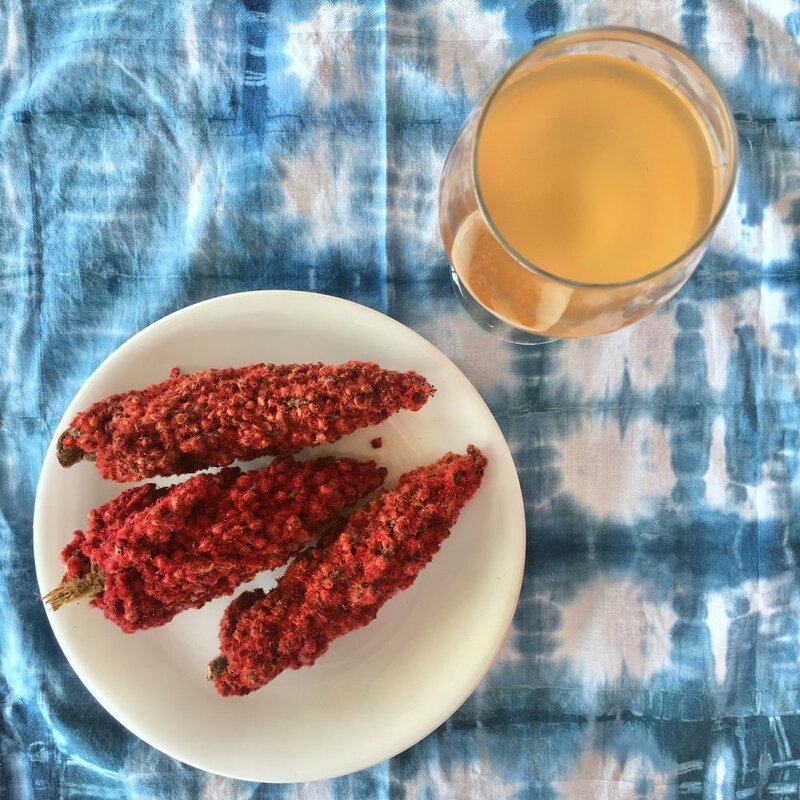 The tree tissue is soft at this point and a scission is easily made and the graft receives the nutrients and energy needed to grow. 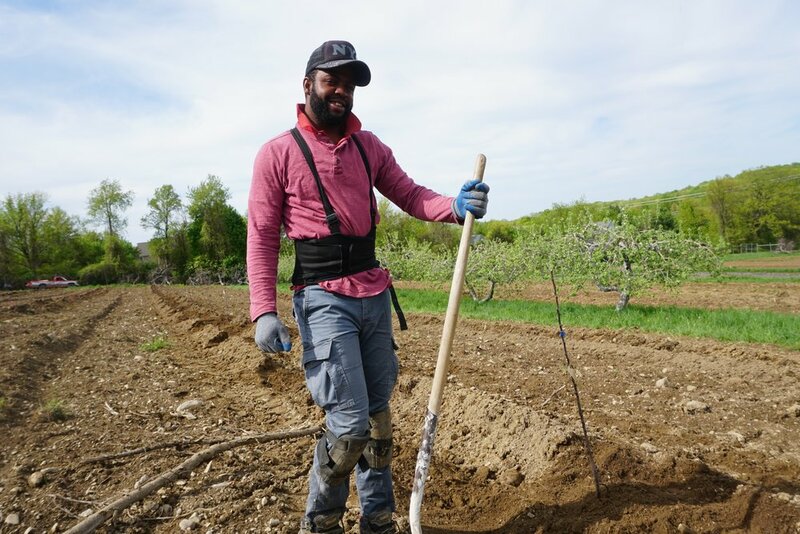 We brought in professional grafting duo Raul and Mary Godinez to work with members of our orchard team — Robin, Ninja and Stefran — to take on the task of completing more than 600 grafts. The first task was to make a clean, horizontal cut taking down the leading branch (the tallest one in the center) to make way for the budwood. We left the surrounding branches intact as they are essential for providing the new graft with food photosynthesized from the robust leaves. These lower branches also offer the fresh grafts protection from the elements as they bond to the tree. 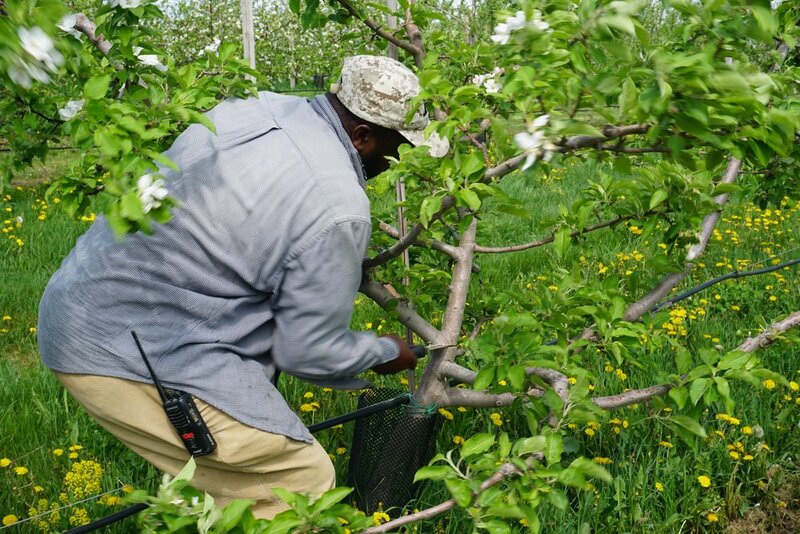 At the end of summer, we’ll be able to remove the remaining branches and fully transition the tree to a new variety. Skillfully, Raul sliced the budwood we cut from our trees in February, exposing the green flesh and placed them in the incision he made in the bark where the lead branch once stood. This type of grafting called a bark graft. After the in-grafts were in place, we carefully secured them to the tree by wrapping them with common electrical tape. Finally, the graft was sealed with grafting paint to protect and bond the graft. Both the electrical tape and the grafting paint will expand as the tree grows. As long as the grafts take to the existing tree, we can expect fruit from them within two to three years! Included in our collection of grafts are Pink Pearl (a trendy sweet-tart), Newtown Pippins (a tart heirloom and a favorite for @treasurycider), Porter’s Perfection (a rot-resistant and powerful hard cider variety), Gravenstein (an aromatic summer apple), Jonagold (a classic, delicious favorite) and Piñata (brand new with a “tropical twist”) apples. 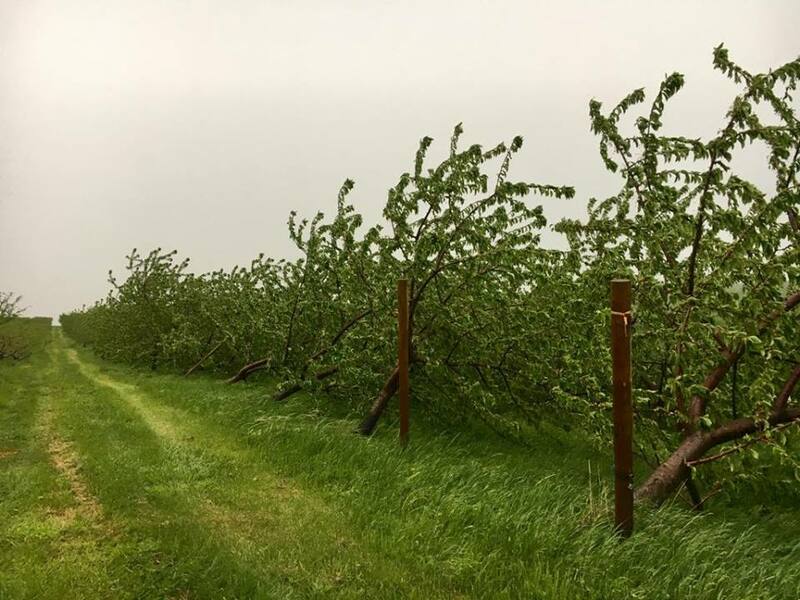 We’re always looking for ways to improve our orchard whether it’s adding more of your favorites varieties, adding new and delicious varieties you can’t find in stores, or replacing rot-susceptible varieties of apples with ones that are more disease resistant for more sustainable farming, we’re dedicated to providing the best produce for our local community. 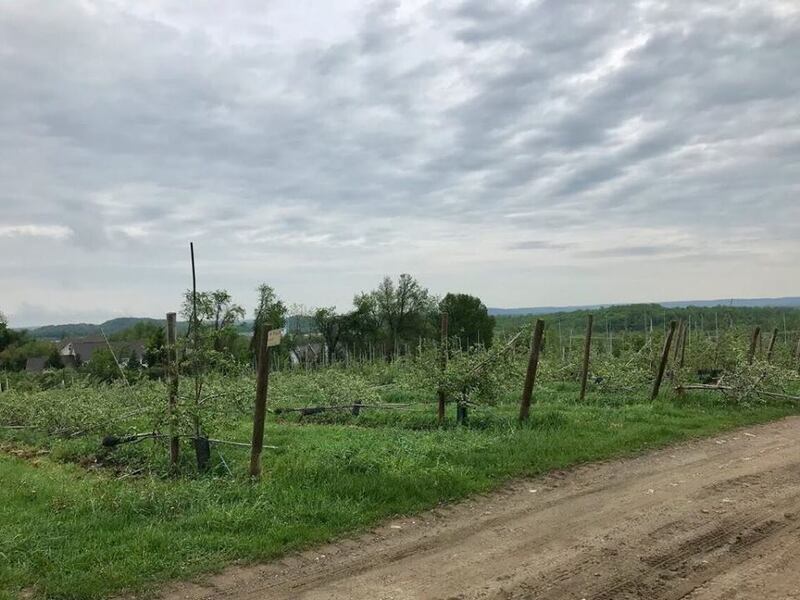 "Young farmers look to hard cider"
Delve into the diversification of Fishkill Farms and our expansion in the market of hard cider and tasting room experience as we seek new opportunities to use our produce as well as new and exciting ways for our customers to enjoy them.